Sometimes I think I have rocks in my head. I entered yet another contest at Marx Foods, this one about using sweet items in a savory dish. Easy peasy, I thought, when I sent my name in. Yeah, right. I had ideas for bits and pieces of a recipe, but none of it came together in a complete recipe. The only thing I was sure of was that I wanted to make some candied bacon. But the more I thought of it, the more sweet-savory ideas I had for the four ingredients I had to work with. I only needed to use two of them, but in the end I used all four. They were: vanilla beans, fennel flower crystals, honey powder, and coconut sap sugar. I'm not a big fan of coconut, but the sugar is from the tree sap, and it doesn't really taste of coconut. It's got an earthy brown sugar flavor, but it doesn't seem to me that it's quite as sweet as brown sugar. The fennel flower crystals were interesting. A pale green, they didn't have a strong fennel scent, but they burst with fennel flavor when I tasted them. And I liked the way they crunched. I wanted to use them as a garnish rather than melting them down and losing the delightful texture. The honey powder is, well, sugar and honey in a small granulated form. Tastes like honey, pours like sugar. And of course, vanilla beans. I started with the idea of candied bacon and toyed with the idea of a BLT, but couldn't figure out what other sweet ingredient I could use in a sandwich. I could have baked a loaf of bread using one of the sugars, but it wouldn't have been a prominent ingredient. Hey, I watch Chopped a lot. I think of things like that. I considered adding something sweet to the mayonnaise in the sandwich ... and then I started thinking about a wedge salad. Yes, my mind wanders off on its own a lot. But once I headed in the salad direction, I saw a lot of opportunities for using the sweet ingredients in a savory way. 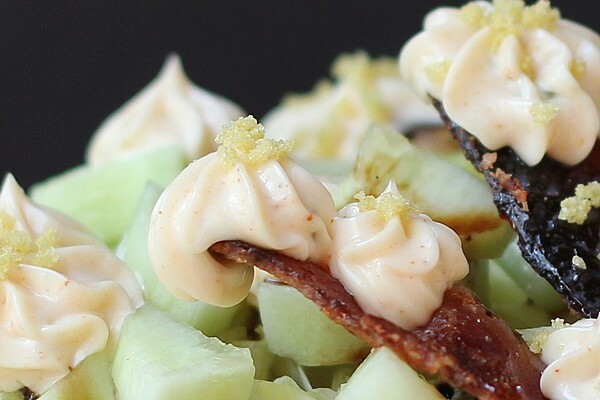 If a BLT ran into a wedge salad in front of a candy store, this could be the result. Surprisingly, it's not really sweet. There are bursts of sweetness from the bacon, but that's tempered by the bacon's saltiness. The vanilla and honey are tempered by the balsamic vinegar. And the fennel flower crystals are a nice accent to the dabs of mayo-based garlicky salad dressing. Preheat the oven to 400 degrees and line a baking sheet with aluminum foil. Lay the bacon strips side-by-side on the aluminum-foil-covered baking sheet, trying not to overlap the pieces. The half-pound should fit nicely on a half-sheet pan. Sprinkle the bacon evenly with the coconut sugar. You want a thin layer over the bacon. If you missed a few spots, you can fill in with a little more sugar. Bake the bacon at 400 degrees until the bacon is done to your liking, checking after 15-20 minutes, and checking fairly often after that. You've got sugar in a hot oven. There's a thin line between deeply caramelized and burned. Transfer the cooked bacon to a wire rack to let the grease drip off. This is great warm or at room temperature, so you can make it in advance, if you like. Put the balsamic vinegar in a small saucepan. Add the honey powder and the split vanilla bean with its seeds. Simmer on low heat stirring, as needed, until the sugar melts and the mixture thickens and it has reduced to about half the original volume. You could do this quickly at a full boil, but the point is to infuse the vinegar with the vanilla flavor, so simmer slowly. When the vinegar has reduced, let it cool, then remove the vanilla pod and transfer the liquid to a suitable container. Combine all the ingredients in a small bowl. Taste and adjust seasonings, as desired. I normally thin my salad dressings with a bit of milk, buttermilk, or yogurt, but I wanted to keep this thick for piping. If you're going for a drizzle, thin the dressing to the desired consistency. Cut a wedge from a head of lettuce and remove the core. Place it on a plate. Cut the tomato into wedges and arrange as many pieces as desired on the plate with the lettuce. Peel and cut the cucumber as desired. I cut mine in quarters horizontally, then into slices. Scatter the cucumber on top of the lettuce and tomato. Cut or crumble the bacon (or use whole strips, if you like) and add it to the top of the salad. I'll admit that quite a bit of the bacon "disappeared" long before salad-making time. Use as much or as little bacon on the salad as you like. I'm sure you'll find plenty of uses for any leftovers. Drizzle the vanilla balsamic over the salad - as much as you like. Leftovers can be mixed with olive oil to make salad dressing, or drizzled over fresh tomatoes and mozzarella cheese. Or, pretend it's an expensive balsamic, and drizzle over strawberries. Dollop the salad dressing on the salad. I used a piping bag, because I was feeling flowery. I didn't use all the dressing, but it depends on how much you like and how large that lettuce wedge was. And remember, you've also got that balsamic! Garnish with the fennel flower crystals. I sprinkled mine mostly on top of the mayo dressing. I thought it looked pretty and sparkly there.